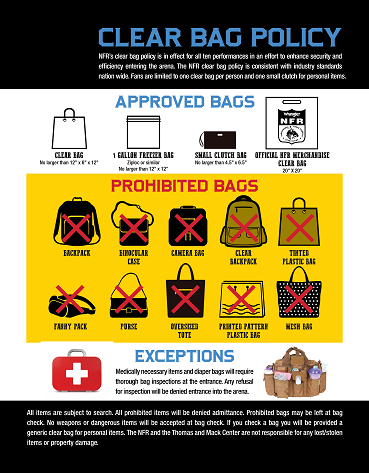 The Clear Bag Policy information below was provided by the Event Promoter of the NFR. Desert Tickets has no control over this policy, and this information is provided for informational purposes only. Why did the Wrangler NFR adopt a clear bag policy? In order to enhance public safety and make venue access more efficient, the Wrangler National Finals Rodeo has adopted a Clear Bag Policy. Fans may bring in one (1) clear bag no larger than 12" x 6" x 12" or a 1-gallon plastic storage bag. Fans are limited to one clear bag per person, along with a small clutch bag (no larger than 4.5" x 6.5") for privacy. Please refer to the pictures above for the approved and non-approved bags. Each ticketed guest can carry one (1) clear bag - either a one-gallon Ziploc-style bag or the 12" x 6" x 12" clear bag - plus a small clutch purse (no larger than 4.5" x 6.5"). The small clutch allows privacy for small personal items. Guests carrying a prohibited bag will not be permitted inside the venue. Fans with prohibited bags will either need to return their bags to their vehicle and transfer their belongings to an approved clear plastic bag or check their bags at the WNFR Check-In location at the Mendenhall Center lobby. Signage will direct you to the Check-In location. If I have certain medical items that I need to bring into the venue and they won't fit in the clear bag, what do I do? Guests carrying medically necessary bags or equipment will be required to have their bag thoroughly inspected by security before entrance will be permitted. What is the policy for diaper bags? Guests with babies carrying a diaper bag will be required to have their bag thoroughly inspected by security before entrance will be permitted. What if I purchase official WNFR merchandise on site at the Thomas & Mack Center, can I bring these items into the venue? Yes. There is an official Wrangler NFR merchandise Clear Bag (20” x 20” size) that is approved for admission into the venue. These approved bags can be brought in by the ticket holder in addition to their approved personal clear bag and/or clutch. All merchandise bags will be required to be thoroughly inspected by security before entrance will be permitted. No. Small clutch purses (no larger than 4.5" x 6.5") are permitted along with either the 12" by 6" by 12" clear tote bag or one-gallon freezer bag. 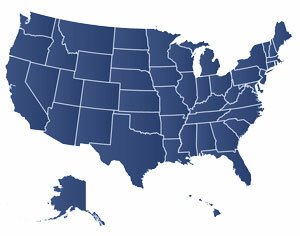 This should enable guests to carry in personal items and expedite entry into the venue. This process will enable staff to move fans through our check-points much faster allowing staff to be more efficient and effective in checking clear bags brought into the arena. There will be less time spent standing in lines at the venue entrances enabling fans to be in their seats well before the opening ceremonies. Fans also will enjoy an improved sense of safety. Any bag larger than the permissible size is prohibited, unless credentialed personnel carrying such belongings have been thoroughly searched.